Summary: In recent years, the use of intrinsic markers such as stable isotopes to study foraging ecology and movement patterns of sea turtles has increased. Despite the widespread use of this technique, gradients in stable isotopes (isoscapes) have been described only at very large scales. Few regional maps of marine isoscapes are currently available making this a main limitation of the isotopic-based investigation in the marine system. Therefore, the best way to interpret the isotopic signature of loggerheads is to calibrate isoscapes using loggerheads themselves. 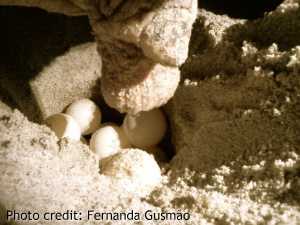 Between 2008 and 2011, we used satellite telemetry to validate the use of stable isotope analysis to infer post-nesting migration destination of loggerheads nesting at the Archie Carr NWR, which accounts for approximately 25% of all loggerhead nests in Florida. We found a relationship about geographic location of foraging grounds and stable isotope signature of loggerheads equipped with satellite tags. Our results support the use of stable isotopes as intrinsic markers for our study population. Here we propose to scale up and apply what we learned in order to identify key foraging grounds used by a larger number of females and their relative importance providing a better representation at the population level. Knowing where adult females spend 99.9% of their time is crucial to develop appropriate conservation and management measures for the protection of the Florida loggerhead population. Results: In recent years, the use of intrinsic markers such as stable isotopes to study foraging ecology and movement patterns of sea turtles has increased. Despite the widespread use of this technique, gradients in stable isotopes (isoscapes) have been described only at very large scales. Few regional maps of marine isoscapes are currently available making this a main limitation of the isotopic-based investigation in the marine system. Therefore, the best way to interpret the isotopic signature of loggerheads is to calibrate isoscapes using loggerheads themselves. Between 2008 and 2011, we used satellite telemetry to validate the use of stable isotope analysis to infer post-nesting migration destination of loggerheads nesting at the Archie Carr NWR, which accounts for approximately 25% of all loggerhead nests in Florida. We found a relationship about geographic location of foraging grounds and stable isotope signature of loggerheads equipped with satellite tags. Our results support the use of stable isotopes as intrinsic markers for our study population. Here we propose to scale up and apply what we learned in order to identify key foraging grounds used by a larger number of females and their relative importance providing a better representation at the population level. Knowing where adult females spend 99.9% of their time is crucial to develop appropriate conservation and management measures for the protection of the Florida loggerhead population.